Fashioned after factory and barn lighting Globe Electric's 1-Light Flat Modern Industrial Pendant adds a vintage industrial feel to any space. This hanging ceiling pendant can be fully dimmable, allowing you to customize lighting ambiance and mood. Ideal for use in kitchens, restaurants, bars, and dining rooms - the exposed bulb in this fixture delivers the perfect look. Includes all mounting hardware for quick and easy installation and requires one 60W vintage light bulb (sold separately). EASY INSTALL: includes all mounting hardware for quick and easy installation. The Michelle Collection Is Modern And Simplistic. A Shepherd'S Hook Hanger Makes This Collection Stand Out. Arching Curves Give Way To Vertical Tapers, Complete In Three finishes oil rubbed bronze, satin nickel, and polished nickel. inchMichelle inch has a chandelier and sconce in the family. Simply smart task lighting. Frame of oil-rubbed bronze holds a white opal glass cylinder shade. Both elegant and useful, this pendant can be used individually or in pairs to illuminate a room or provide focus for the task at hand. The height of the pendant can be adjusted - choose from the three lengths of rods or use them all. The TRUXTON single pendant features an oil rubbed bronze finish with faux wood accents. This mix and match style is decorative and unique. The open metal cage adds additional appeal. This is perfect for the kitchen island as a single or in clusters as well as many other commercial applications. Introduce some industrial charm to your contemporary space with Globe Electric's Baldwin Industrial Cage Pendant. An original design from downtown Philadelphia, Pennsylvania, this hanging pendant features an industrial open-bottomed steel bulb guard that showcases a vintage Edison bulb beautifully. Check out Globe Electric's selection of designer vintage Edison bulbs to create a look that is all your own. The designer woven fabric cord adds that touch of class to compliment any dicor. Includes all mounting hardware for quick and easy installation and requires one medium base 60W bulb (sold separately). 1-Light Flat Modern Industrial Oil Rubbed Bronze & Gold Pendant Fashioned after factory and barn lighting Globe Electric's 1-Light Flat Modern Industrial Pendant adds a vintage industrial feel to any space. This hanging ceiling pendant can be fully dimmable, allowing you to customize lighting ambiance and mood. Ideal for use in kitchens, restaurants, bars, and dining rooms - the exposed bulb in this fixture delivers the perfect look. Includes all mounting hardware for quick and easy installation and requires one 60W vintage light bulb (sold separately). 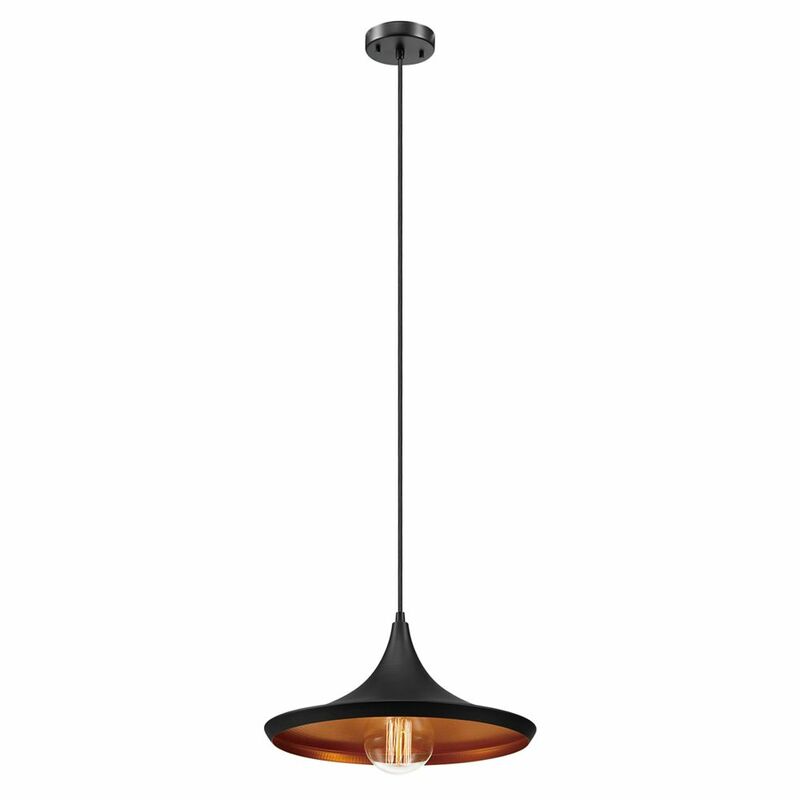 1-Light Flat Modern Industrial Oil Rubbed Bronze & Gold Pendant is rated 4.7 out of 5 by 22. Rated 5 out of 5 by TCW24 from Fast timing I bought three pendants and they were exactly what we wanted and arrived on time. Rated 5 out of 5 by Ann from Beautiful pendant light. Love the rubbed bronze outside and... Beautiful pendant light. Love the rubbed bronze outside and the soft gold inside, Looks great over my kitchen sink! Rated 5 out of 5 by Angie from Great looking fixture and easy to self install. ... Great looking fixture and easy to self install. Rated 5 out of 5 by Jeff from This is an inexpensive lamp that looks great. We put... This is an inexpensive lamp that looks great. We put an Edison light in it and it's perfect. Rated 5 out of 5 by Bambi from GORGEOUS! Flat black with gold inside which makes for a slightly radiating shimmer when the light... GORGEOUS! Flat black with gold inside which makes for a slightly radiating shimmer when the light is on. Swanky, industrial, gorgeousness. Rated 5 out of 5 by Torim127 from Beautiful!! I absolutely love this!! Goes perfect with my mid-century modern decor. Rated 5 out of 5 by Nikki from Exactly what I was looking for; beautiful style, great price. A perfect fit! Exactly what I was looking for; beautiful style, great price. A perfect fit!